Microsoft has unveiled a number of new applications for the Android handsets and other devices.They have managed to launch those applications which look cute as well as curious. 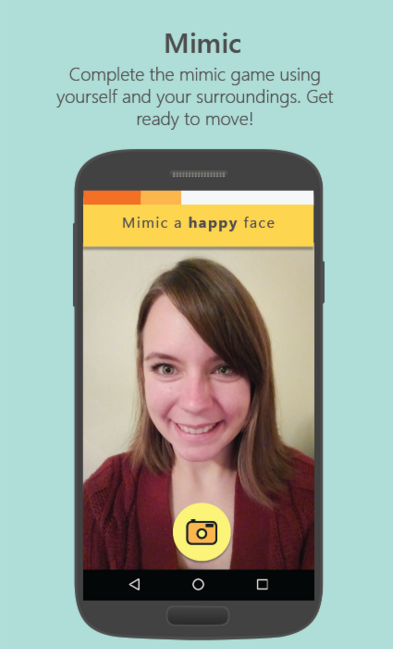 One such application is the Mimicker Alarm developed by Microsoft Garage. Microsoft Garage is an experimental wing of Microsoft. Mornings are a nightmare for most of us. Many of us have a clam sleep under the blanket in the cold morning. Most of the people across the globe love to cover their entire body under their blanket and remain asleep till 8 o’clock. May be you require somebody to pour a bucket of water over you to wake you up. But with the new Mimicker Alarm from Microsoft, these won’t be needed. Most of us set alarm on their clock and when they ring, we just tap on the snooze button to turn it off. But Mimicker Alarm is quite different from them. Mimicker is designed in such a way that you are required to play a game inorder to turn it off. Another interesting thing about the alarm is that, if you can’t finish the game in time the application assumes that you fall asleep again. Then it will start ringing and this continues until you successfully complete the task. By the time you busy with completing the game, your sleepiness will go away and you will become active for the day. These kinds of wake up alarms are available in plenty with Google Play Store. But Mimicker Alarm differs from them in respect of the kind of games provided. Normal wake up alarm applications provide simple maths twisters for the user to solve. But Mimicker Alarm sometimes asks you to express happiness or surprise, which the application analyses with the help of front facing cam. Sometimes the application may ask you to search for a particular colour from the given one or ask you say some tongue twisters. My advice is having Mimicker Alarm type application in your smartphone may give you right start for the day. If the morning is perfect and pleasant, the day will be automatically will be pleasant and perfect. This alarm could activate our sense organs at the time we wake up and make them work. This could give us excitement and pleasure which will last for the day long. I would suggest that Mimicker Alarm will suite those smartphone users who have a tendency to turn off their alarms when they ring in the morning and continue with the sleep.